It was a great weekend for the SA sides in SupeRugby. In the first couple of rounds of the SupeRugby competition we watched as the New Zealand teams took each other on with a break-neck style of running rugby, with play being taken from end to end in a matter of seconds. The result of this was an exciting feast of tries. In the eyes of the rugby-mad public it seemed as though the Kiwis had discovered a hidden chapter in the rugby manual and were now stunning the world with this secret knowledge. A sharp contrast to this was the lacklustre brand of rugby which was being played on the southern tip of Africa, a brand of rugby where games were ground out and victories came mostly won by the boot. Fears were growing in South Africa that our teams would not be able to compete with the 7-point scores of the Kiwi sides if we were only moving up in increments of 3. However, something happened this past weekend that still has us stunned. The first shock of the weekend came in the form of the Cheetahs where the young fly half Johan Goosen showed a superb return to kicking form and hints of what a great Bok flyhalf he will be one day. Cheetahs rugby in South Africa has always been a style of running rugby where the opposition find themselves chasing shadows more often than not. However, their let-down has usually been their defense. This time however they seemed composed, committed and very patient on their defense, thus allowing them to score off the mistakes of the Highlanders. With a final score of 36–19, this should be the confidence booster that they need for the rest of the campaign. 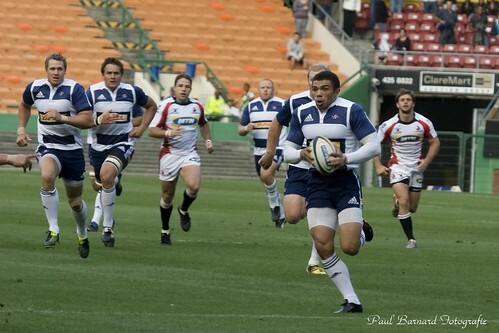 Bryan Habana and his Stormers teammates had a 36-34 win over the Chiefs. (c) Paul Barnard. Down in Cape Town, the Stormers were to face the current SupeRugby champions, the Chiefs, who were coming into the game with two wins compared to the Stormers zero, after having lost to the Bulls in Pretoria and the Sharks in Durban. Although the Stormers were expected to win in Newlands their ability to score tries was in question, having only scored 2 in 160 minutes of rugby. They managed to hold on to a two point lead of 36–34 against the champions. After a dismal showing against the Western Force last week, the Blue Bulls coach Frans Ludeke made wholesale changes which saw seven new faces in the starting line up to face the Blues in what is known as the Garden of Eden. This strategy worked as it saw the Bulls record their first ever win in Auckland with a 28–21 final score line and a game which saw Pierre Spies returning to form. I had previously written about The State of South African Rugby and expressed my concerns. It may still be too early to get overly excited about the Springbok results from this past weekend as the competition is a marathon rather than a sprint. I do however take encouragement to see that we can take on the “world’s best” and beat them. Let’s hope that this will translate into a Rugby Championship trophy for the Green and Gold. How do you think the South African teams will fare in this season’s competition? Feel free to leave a comment below with your views on their strengths, weaknesses and the SA players who have impressed you so far! You can follow Nsovo Shimange on Twitter @NSOVOworksHARD.